Two to one. That’s how I’d score the wrangling between the two parties at yesterday’s health care summit. There were no smackdowns. Opponents who seemed to be pinned momentarily sprang back up, bounced off the ropes and got right back into the ring. Republicans get a point for a sort of backhanded honesty. As President Obama said several times, they stuck to their talking points. And while this didn’t contribute to the “debate” and “exchange” that was supposed to take place at the summit, they understood that this was not the real purpose of the all-star event. The real goal was to swing as many viewers of Fox News and CNN (and yes, even MSNBC) over to their side as possible. They realized that this could be accomplished much more effectively by reiterating, over and over, certain words and phrases. For the Democrats, the stated objective was to have a free and open exchange of ideas, to see if there was any room for a meeting of the minds. If there was, a bill could be put together that would sail through the House and then the Senate with 60 votes. In other words, bipartisanship at long last. Democratic leadership knew better. They saw that this was a stage upon which they could paint the Republicans as obstructionists. In truth, Republicans are more interested in the role of personal responsibility than are Democrats, although Democrats give the concept plenty of lip service. Example: Rep. Paul Ryan, whose star has been steadily rising, would prefer to dismantle Social Security and Medicare. He skillfully avoided that blunt pronouncement at the summit. I interviewed the Wisconsin congressman 10 years ago when he was first elected to the House, and he described them both as welfare programs. He has remained consistent, and would like to see Medicare reduced to a system of vouchers that seniors can use toward the purchase of private insurance coverage. Which is why I give Ryan and company a point for raw honesty. That’s Republicans 1, Democrats 0. But the Dems scored, in my view, by successfully making the case that something fairly big has to be done. Passing a few items piece-meal, such as tort reform, eliminating consideration of pre-existing conditions, and allowing purchase of policies across state lines, won’t cut it. The health care system is too sick for patchwork solutions. So that evens it up. But I said two to one. Who gets the second point? Well, Obama won some pretty intense verbal volleys. He made several Republicans, including John McCain, Lamar Alexander, and John Boehner, look like errant children who had been caught reaching into the cookie jar. True, this was almost inevitable, since the Republicans couldn’t have turned down participation in the summit, and yet they couldn’t appear to be disrespectful to the president, either. Nonetheless, Obama took full advantage. Will Thursday’s points make any ultimate difference in health care reform? That’ll be decided in a different match on a different day. The opponents have retreated to their corners. New strategies are being hatched. For those of you hoping for a good clean fight, better luck next time. There was one piece of red meat in President Obama’s health care reform plan, announced yesterday. That is, one proposal that’s bound to get both supporters and opponents fired up over the reform issue, which was dead in the water. On the other hand, this is an idea most liberal Democrats can embrace, and one that’s going to have some solid popular support. Health insurers played right into it this month by announcing premium increases of up to 39 percent. States already have some control over insurance rate increases. But to have the heavy hand of the federales involved takes things to a whole new level. 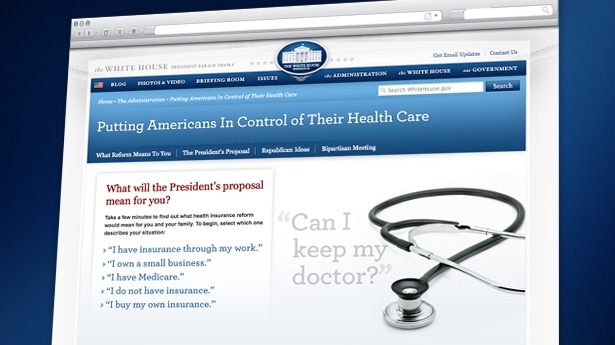 There weren’t a lot of details in the plan officials posted on the White House Website. It simply says: “… if a rate increase is unreasonable and unjustified, health insurers must lower premiums, provide rebates, or take other actions to make premiums affordable. Questions. What is the definition of “unreasonable” and “unjustified?” It clearly says, “health insurers must lower premiums,” which to me indicates a suggestion of direct control. But then in the next sentence, it talks about an effort to “help states determine how rate review will be enforced.” To me, that says states would maintain control. Will this proposal survive the second round of the health care “debate?” Doubtful, but it gives both sides an actual issue to talk about – something missing since the Democrats decided to drop the public option. A couple of other items in the Obama plan caught my eye. The government still wants to penalize people for not buying health insurance, but the fees would be so negligible it’s hard to imagine them being a factor for people weighing whether or not to opt out. For example, the penalty is $325 in 2015. If you’re 25 years old, healthy, and making $60,000 without benefits, I doubt a $325 penalty would give you pause. And giving healthy people an opt-out really defeats the purpose of a universal health insurance mandate. Still, the requirement to buy health insurance – without a lower cost public option being available – does not sit well with the American public. The plan also eliminates the special Medicaid treatment for Nebraska, which was universally panned by both sides. That made it a safe political bet for the Obama camp, particularly since the American public doesn’t like it either. Thursday’s summit may make for some good political theater. But the real question is whether the Democrats will have the guts to ram these proposals through via reconciliation bills that require just 51 Senate votes. If that happens, then the real howling will begin. And it will make Round II of the not-so-great health care reform debate much more interesting than petty bickering and back stabbing that characterized Round I. The Center for Science in the Public Interest is taking on the Department of Health and Human Services over its “Heart Truth” program. In a letter sent to the HHS’ National Heart, Lung and Blood Institute this week, CSPI criticized the “inappropriate” use of corporate sponsors like Coca-Cola. The government launched Heart Truth in 2002 with the goal of encouraging women to recognize the risks of heart disease and adopt healthier lifestyles. It has enlisted the aid of politicians and celebrities such as Laura Bush, Nancy Reagan and Heidi Klum, who wear signature red dresses to promote the cause. But it has also accumulated a long list of corporate sponsors that include, in addition to Coca-Cola, Tylenol, Cheerios, Hamilton Beach (kitchen appliances) and Johnson & Johnson. 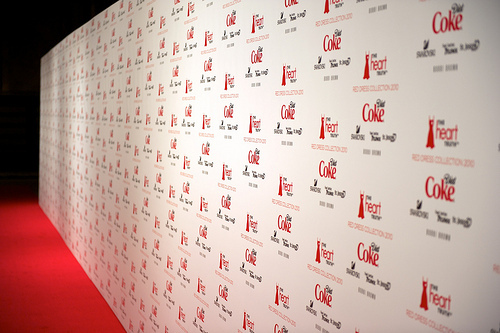 “Though Coke features Diet Coke in its marketing effort, surely NHLBI is aware that that company is a major contributor to America’s epidemic of overweight and obesity,” wrote Executive Director Michael Jacobson. The CSPI, founded in 1971, is also known as America’s food police. Its goal seems to be to take all joy out of food and beverage consumption. And, I have to say, I don’t like the organization’s campaign to put special taxes on what it considers junk food and unhealthy drinks. Government shouldn’t use the tax system for behavior modification (I make an exception for cigarettes). At the same time, the center has a point with regard to the Heart Truth program. Why are the feds giving their implied stamp of approval to companies selling products that contribute to the kinds of health problems HHS is trying to target? What ever happened to just plain public service announcements? Does everything have to have a corporate sponsor? 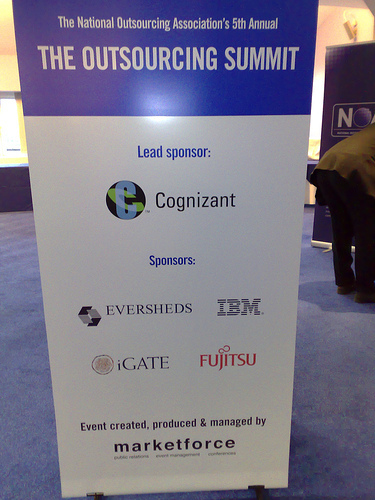 Outsourcing has become a great American tradition. It started with manufacturing, but now thanks to the Internet we can outsource services as well. Whether this has been in the best interests of the United States is another issue. It’s a fact of life and there’s nothing on the horizon to reverse the trend. Which brings me to outsourcing health care. 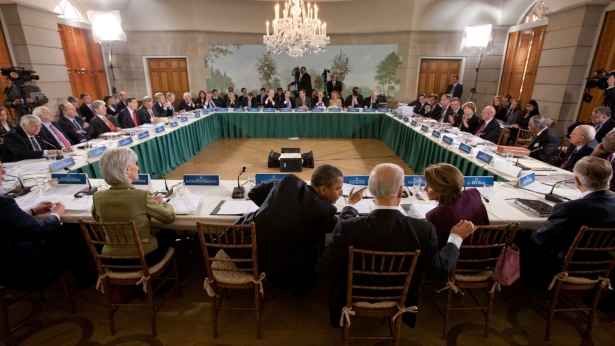 President Obama has set up a televised “summit” with congressional leaders on health care reform for Feb. 25. He wants to solicit fresh ideas, since the packages passed by the House and Senate are hopelessly at odds. And because for whatever reason, Obama himself has shown virtually no leadership on the issue. One of the themes we’ll hear from both Republicans and conservative Democrats is that we should be turning the free market loose to work its wonders on health care. If you really want to talk free market, I can see only one way to bring down the cost of health care. And that’s to increase the supply of health care providers. We could do that by partially outsourcing primary care. We already have home medical tests and there’s no reason why the selection can’t be expanded and refined. The information they generate could be fed into a processor, packaged and sent to physicians in other countries. To pick a country at random, let’s say India, for example. The off-shore provider applies for and receives a U.S. special license to offer basic services, via Skype and other software. Following the “visit,” he writes a prescription which is filled at the lowest-cost pharmaceutical center on the planet, something easily accomplished through a global Internet search. Your credit card is charged for the visit and the prescription, which is Fedexed directly to you. If the data show something beyond the expertise of the primary care physician, you get a referral to a specialist in your area. Cost to consumer: $25 instead of the $250 you might now pay for an office visit, a battery of tests, and a prescription. Of course, there’s nothing to stop domestic providers from offering Web-based services either. It’s just that they’d have to compete cost-wise on a global level. I understand the arguments against this approach. I can hear the howls from the American Medical Association. Too difficult to regulate, they’d say. American health care providers are the best in the world, they’d say. American-produced drugs are the gold standard, they’d say. Nevertheless. If you make a decision to continue running health care as a for-profit business instead of a basic social benefit – as is the case in most developed countries – then you need to expose it to the same supply-and-demand factors that regulate prices in any other industry. It may be true that Cadillac health care is available in the U.S. But what good is that when so many people can’t afford to get behind the wheel? 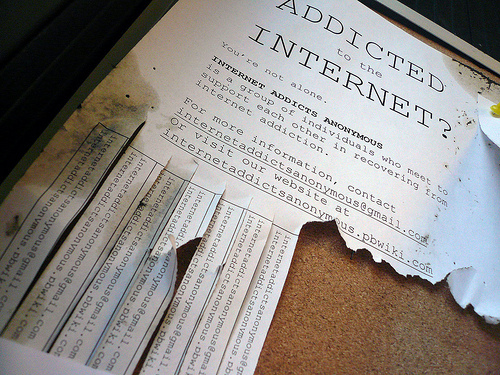 Internet addiction is a controversial concept in the United States. The American Psychiatric Association passed on including it as a classified disorder at its annual meeting a couple of years ago. Nevertheless, there are many psychologists and other mental health professionals in the U.S. who specialize in working with people who believe their life has spun out of control thanks to heavy engagement with the World Wide Web. And the issue is back on the front burner again with mental health experts debating inclusion of the problem in the new diagnostic manual (DSM-V) due out in 2012. A group of researchers have come up with what might be fresh ammunition to use in getting the problem classified. A newly released study on Internet addiction in the United Kingdom concludes that the percentage of Web users who qualify as Internet addicts are also much more likely to be suffering from clinical depression. Researchers at the University of Leeds evaluated 1,319 people aged 16-51 for the study, which was published Feb. 10 in the journal Psychopathology. They concluded that 1.2 percent of them were internet addicted. That may not sound like much, but it’s twice the rate of problem gamblers to the overall gambling population. Not only was the segment more depressed, but men and young people tended to be “addicted” more often than women as a whole. In a university news release, lead author Dr Catriona Morrison said: “Our research indicates that excessive internet use is associated with depression, but what we don’t know is which comes first – are depressed people drawn to the internet or does the internet cause depression? Internet addition, incidentally, is already taken very seriously in China, where 4 million children are classified as addicts. The clinical guideline is that you’re an addict if you’re online for more than six hours a day, three months in a row. This is a country, though, that’s worried about the free-flow of information, and I think that plays a key role in how the government views Web activity. There are a lot of reasons why the American education system is in trouble. One of them is that, because of cultural shifts and changes in the family, public school teachers spend absurd amounts of time dealing with behavioral, rather than educational issues. Here’s another: Kids who take intellectual pursuits seriously have been stereotyped in very unflattering ways. It’s not just that school football and basketball players are more popular, but kids are viewed as oddballs if they’re on the debate team, or win a national science project award. 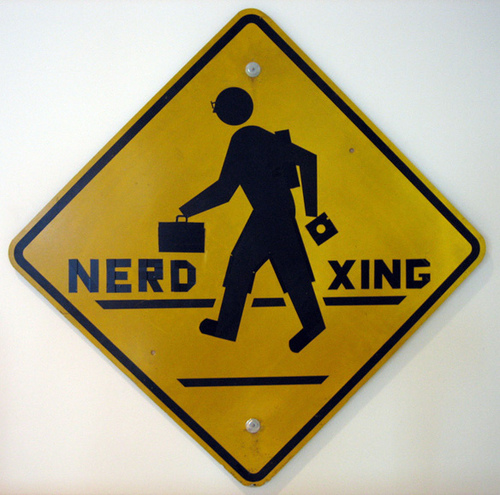 “Nerds” and “geeks” may be great in math and physics, but they are rarely held in high esteem by their peers. Trouble is, this is a country starving for innovation. We need new products and new technology to pull our economy out of the ditch. Now, psychologists are starting to analyze why society has reached this point. The February issue of the American Psychological Association’s Monitor on Psychology features an article called, Why Did ‘Nerd’ Become a Dirty Word? It’s a Q & A interview with child clinical psychologist David Anderegg, PhD, author of Nerds: Who They Are and Why We Need More of Them. Surprisingly, Anderegg says kids learn that being a nerd is bad news not only from their friends and school chums, but from adults as well. The word was apparently born in Detroit in the 1950s, although “nerd” first appeared in a Dr. Seuss book, If I Ran the Zoo. By the early 1960s, it became a synonym for “square” and implied that someone was socially inept. Although you might consider the term playful, two European studies cited by the Monitor show that students deliberately avoid interest in math and science in order to escape the label. Women who shun computer science do so because they associated it with a nerdy culture in which men stay up late writing computer code, guzzling energy drinks and showering infrequently, according to a study at Sanford University. In the study, women were asked the question: “How interested are you in computer science?” Fewer said they were interested when questioned in a room decorated in a stereotypically nerdy theme: Star Wars posters, old computer parts on the floor and a bust of Spock on a desk. More said they were interested when questioned in a neutral room. Conclusion: Changing the field’s “look” may alter its image and encourage more young people. There’s definitely a place for recommendations about healthy eating. Who doesn’t know they should be gobbling down plenty of green leafy vegetables? 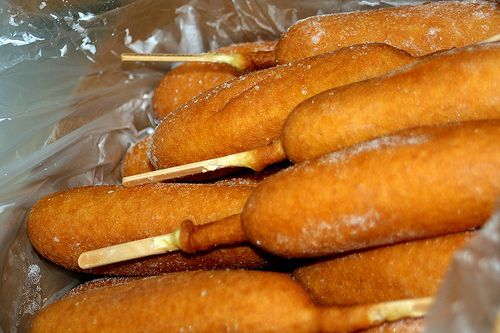 But I have to admit, after reading Jane Brody’s take on Michael Pollan’s book, Food Rules: An Eater’s Manual, this week in The New York Times, I had a sudden urge to eat a corn dog. In other words, put the Big Mac on the ground, sir, and slowly back away. OK. Brody does admit to an almost-nightly ice cream habit though. But low fat, and only half a cup. Very, very admirable. So, I was surfing around the Web and saw what I believe to be the perfect antidote to the Times’ bean-sprout-tofu-all-organic food coverage. It’s an Orlando Sentinel piece on “deep fried everything.” As it turns out, you can stick just about any food into a deep fryer and it tastes better than it did before. I suppose to some people, you could even make a running shoe edible as long as it was deep-fried. I had trouble picking out my favorites, but they are (not in any particular order): deep fried bacon; deep-fried ravioli stuffed with Snickers bars; deep fried macaroni and cheese; and deep-fried pizza. Deep fried macaroni and cheese is an absolutely sound food choice, by the way. But only have half a cup, and go with the low-fat variety.